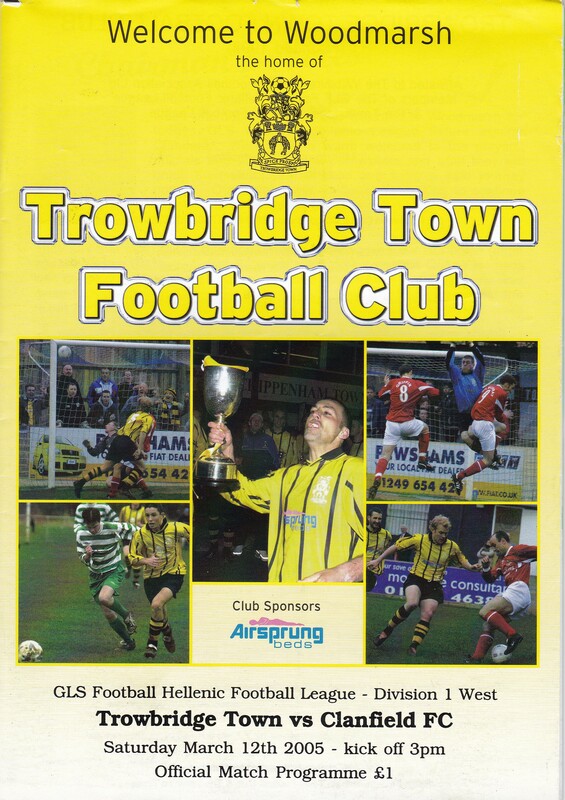 Trowbridge returned to the top of the table with a fine win against a vastly improved Clanfield side. Trowbridge attacked from the start, Dave Mitchell running onto a through ball in the 5th minute but ‘keeper Jason Hunt got to the ball first. After 11 minutes, Trowbridge were awarded a free kick taken by Adam Nunn but the resultant header form Ricky Trott went over the crossbar. Clanfield almost took the lead after 14 minutes. David Hamill poking a shot towards goal from close range but Adam Sheppard saved well with his feet. A minute later at the other end, Adam Nunn scooped the ball past Hunt but the ball went inches wide of the post. Gordon Saunderson and Dave Percival both went close before half time but the well-organised Clanfield defence kept the score line blank. In the second half, Trowbridge continued to pass the ball well and some excellent play led to an Adam Nunn cross that Percival headed over the crossbar. In the 54th minute, Dave Mitchell should have given Trowbridge the lead. He was through one-on-one with the goalkeeper but Hunt did well to block the shot. Mitchell should have been allowed a second one-on-one opportunity shortly afterwards but was deemed offside as he ran through when clearly he wasn’t. However, fortunes tend to even out and Trowbridge were awarded a penalty on the hour for a handball. The decision seemed a little harsh but Dave Percival tucked the ball away nicely to make it 1-0. Neil Kirkpatrick brought on new signings Dan Lardner & Paul Ranger and both did well. Lardner had three chances in quick succession. His efforts were saved in the 76th & 79th minute. But the one in between with 76 minutes gone was put away from close range to make the game safe at 2-0. In the latter part of the match Clanfield did not give up, Dave Hamill hit the inside of a post with a shot across goal with a couple of minutes remaining. However, Trowbridge could also have added to their total, Dave Percival nearly making it three with the last shot of the match but Hunt saved well yet again.